For cats, the great outdoors is anything but great. Whether they live in the city, in the suburbs, or in the country, outdoor cats face a multitude of risks. Many guardians believe that cats are happiest when roaming outside, when in fact cats are more likely to die prematurely from diseases, poisons, speeding vehicles and abuse by humans when allowed to roam outdoors. 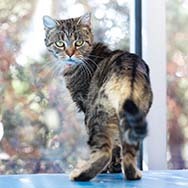 The lifespan of a free-roaming cat is short, compared to the 15-18 years for the average indoor-only cat. The Wisconsin Humane Society operates the state's largest Wildlife Rehabilitation Center, and we are concerned with the welfare of both domestic and wild animals. We encourage cat guardians to keep their cats indoors to protect their animals, as well as native wildlife. Keep your cat indoors. Outdoors cats have a much shorter life span than those who live indoors. If you currently allow your cat outside, check out these tips for training him or her to stay inside. Make sure your cat wears a collar and an identification tag. Also consider having your cat microchipped. The microchipping procedure is fast and easy, and can make a big difference in helping you get your cat back if he or she should go missing. All cats adopted from the Wisconsin Humane Society leave with a microchip. Spay or neuter your cat. This surgery helps reduce overpopulation and has helath and behavior benefits for you and your cat. The Wisconsin Humane Society spays or neuters all cats prior to adoption. We also have a Spay Neuter Assistance Program (SNAP) and a Spay/Neuter Clinic. For more information, call the shelter at (414) ANIMALS or make an appointment at our Spay/Neuter Clinic at www.wihumane.org/clinic. Encourage neighbors, family and friends to keep their cats indoors.